Sorry I'm late posting today; my guy hurt his foot and naturally I'm the family nurse. While I'm off pampering my poor love and running him to the doctor, here's an online typography quiz you can take to find out which typeface best suits your personality. Interesting. I would have picked something old-fashioned, like Courier New, so maybe it even fits. I just checked the blog template and I'm using Verdana for PBW's text, but I picked that because from my POV it was the easiest to read. What typeface did you get? Let us know in comments. Sorry to hear your guy's been hurt. Hoped it's not serious. I liked this little quiz. Fonts fascinate me. I got Futura. It describes my style pretty well. Distinctive and different in the most brilliant ways, you favour elegant designs that have a retro feel. You have strong credibility, and known for being flexibile and very reliable. That one definitely suits you, pal. Thanks also for the kind words. He can't walk without a lot of pain, but I don't think anything is broken. Probably a bad case of tendonitis. 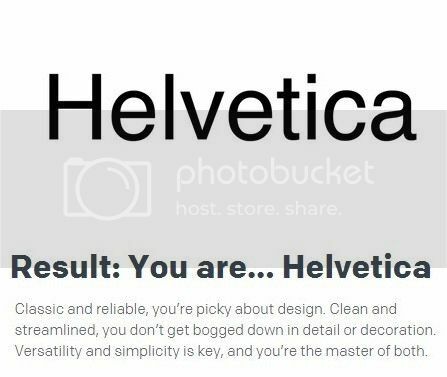 I got Helvetica too. Just a quick question, what on earth is kerning? I had no idea how to answer the question because I'd never heard of it, but I shall pop over to google & check it out. Hope you guy is feeling a bit better now. Thanks, Fran. We're going to my podiatrist today to get him x-rayed and diagnosed. To answer your question (and the one in the quiz) kerning in typography is the adjustment of spacing between letters, usually to bring them closer together. Sometimes this doesn't turn out too well, as you can see in the pics in this article. Most writers hate automatic kerning in word processing programs; I just find it annoying and turn it off.